If you are looking for a great dining experience, then look no further because the Nook and Kranny Kafe serves wonderful food in a great atmosphere. Each dish is masterfully crafted to ensure that you leave satisfied and coming back again for more. In the mood for breakfast? No problem – they serve it here all day! Create an omelet your way by choosing from 15 different ingredients – or make your own custom frittata. They also have customizable egg and cheese sandwiches, healthy oatmeal, Classic Eggs Benedict, French Toast, Belgian Waffles, Corned Beef Hash, a delicious Monte Cristo, and plenty of sides to complete your meal. Stopping in for lunch? Then start your meal off right with a warm bowl of Chicken Corn Chowder. Then fill up on favorites like their Hot Roast Beef Sandwich, Chicken Finger BLT, or Grown Up Grilled Cheese. Another guest favorite is the Nook & Kranny Chicken Sandwich that comes with sauteed chicken, fresh spinach, bacon, cheddar cheese, and honey mustard – all on your choice of bread. 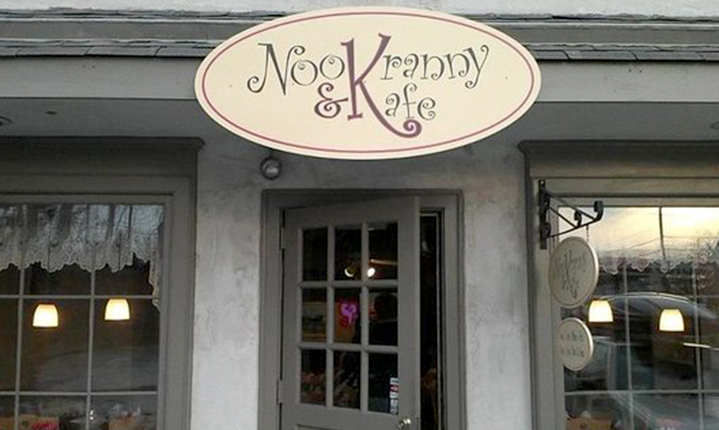 The Nook and Kranny Kafe is located at 847 Valley Forge Road in Phoenixville, PA. They are open Monday through Friday from 7:00 AM to 3:00 PM and Saturdays and Sundays from 8:00 AM to 3:00 PM. Lunch begins at 11:00 AM daily. For more information visit their official website or call directly at (610) 933-5393.